Slacklines, wobble boards or BOSU balls are widely used by athletes and patients to enhance their balance. They assume that an enhanced balance leads to an improved sport performance and a reduction in the number of injuries. However, a recent meta-analysis found that balance training only improves balance in the trained task and not in other balance tasks (all trivial effect sizes), which suggests a general balance ability does not exist! Since most daily activities do not involve keeping balance at unstable surfaces such as a wobble board or a BOSU ball it can therefore also be questioned wether we should train this. Similarly, sport performance usually also doesn’t involve such unstable surfaces, which suggests balance training using unstable surfaces may be a waste of time. Moreover, while there is usually plenty of time to correct a loss of balance in traditional balance training, there is limited time to correct a loss of balance in most sports situations due to the short time for force application (for example, the ground contact during running, see Figure 1). Therefore, traditional balance training may have even more limited transfer to high-intensity sports. Figure 1. 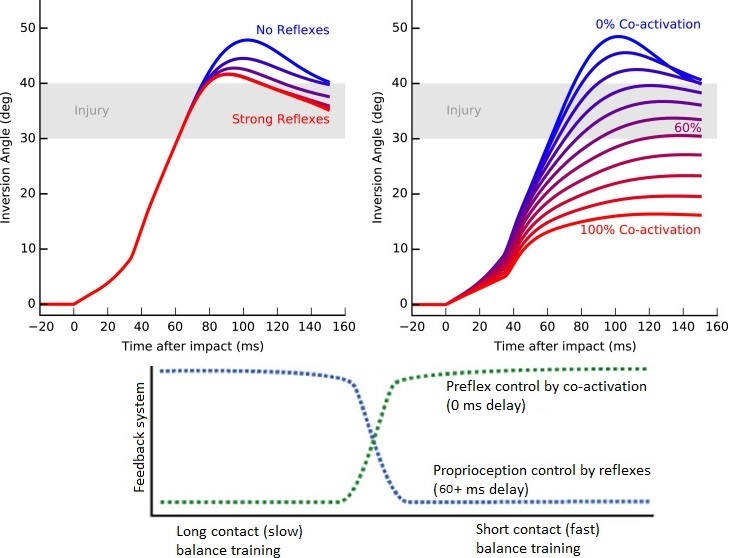 Preflex control by co-acvitation is the dominant feedback system when there is not enough time for reflexes to correct perturbations, while proprioception is the dominant feedback system when there is enough time to correct pertubations. 2) Reduce the amount of muscle slack and hence improve sport performance. Bosch, F. (2015). Strength training and coordination: An integrative approach. Ten Brink, The Netherlands: 2010 Publishers. Nice article! Can you tell us the name of the recent meta-analysis ?